The modern hedge trimmer is a perfect replacement for the conventional methods of trimming and landscaping. Millennials and novices might have a problem coming up with a name for the predecessor of hedge trimmer or imagining something less efficient, but that’s not the focus of this entry. Whatever the name for hedge trimmer-equivalent of yester-years, the modern hedge trimmer is a perfect replacement. Whether it is gas-powered, electric, or battery-powered, the modern variants are powerful, easy to use, lightweight and compact, and quite affordable. In light of their practicality and usability, you don’t have to spend an extra coin enlisting professional assistance. Hedge trimmers are a must-have tool for people with lawns, yards or garden that necessitate shearing once a while when it overgrows. Unlike traditional alternatives – manual clippers, I just remembered the name – you can do a lot of landscaping and shearing within a fraction of the time it would take manual clippers, and with considerably less effort. Coming up with a list of the best hedge trimmers from among those available on the market is admittedly an uphill task. It’s an onerous undertaking that demands thorough research to identify the products whose performance, longevity, usability, convenience, and affordability stand out. Additional steps involve comparing the top contenders against each other, dropping off the ones that lose the fight and refining the search further until we’re left with the best of the best. Irrespective of your unique requirements, all the products we feature here bring together the best of all words. They are high performance, durable, and affordable products capable of the most accurate, quick and effortless shearing of different hedges in average-size yards, lawns, and gardens. 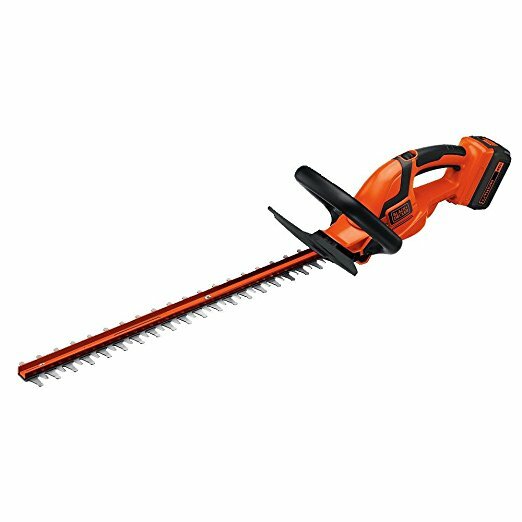 Any person familiar with power tools will not at all be surprised by the fact that the Black & Decker LHT2220 trounces all other hedge trimmers to emerge first among the best hedge trimmers on the market. Expectedly, it combines all the essential features homeowners, professional trimmers, and enthusiastic DIYers look for in a hedge trimmer, and arguably best of all, it has a budget-friendly price tag. And it offers the user all the characteristic advantages of a battery-operated machine; it's very portable as you don't have to drag a cable with you, it's environmentally friendly, and best of all, you're spared the frustration of mixing oils and gas as gas-powered models necessitate. To guarantee ease of use, efficiency, and convenience, the Black & Decker LHT2220 spots a lightweight and compact design. Consequently, operating and holding the 22-inch cordless tool for prolonged periods of time does not expose you to the tribulations that come with using or handling a heavy and bulky machine. The likelihood of suffering hand strain or fatigue or of developing unsightly blisters all over your hands is very minimal. The ergonomic design of the handle, for instance, coupled with the inclusion of a soft rubberized grip significantly increases comfort, encouraging the user to work for hours on end with minimal fatigue. With a weight of just 5.7 pounds, it is one of the lightest hedge trimmers you'll find on the market. The weight won't wear you down as you work and it will go a long way to help you quickly and effortlessly manoeuvre the machine into hard-to-reach and tight spots. To keep you safe, it has a factory-installed plastic guard for protecting your hands and your face while trimming. It keeps the debris and other fast flying and most dangerous materials from coming into contact with your face, thereby harming you or your loved ones in the process. The plastic is clear enough to allow you see through to the objects you are cutting, meaning that precision will not be a problem. The Black & Decker LHT2220 is no slouch when it comes to performance. 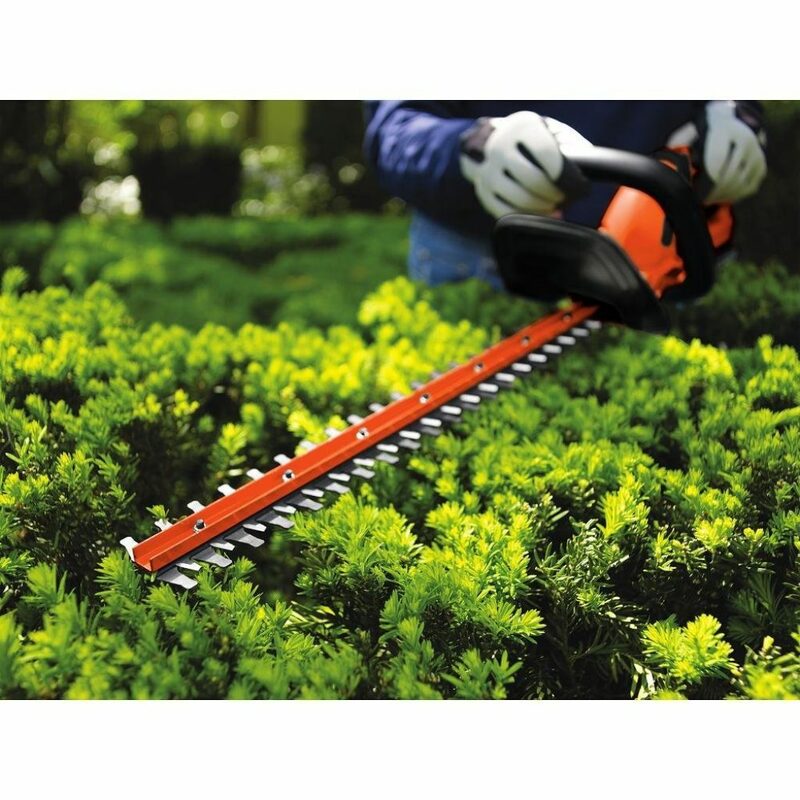 It has dual-action cutting blades that make short work of the tallest and thickest hedges. The machine’s performance is effective and smooth, which is surprising for a product that is as affordable and as compact. Additional impressive features include the long-lasting and powerful 20V battery and the durable 22-inch blades that are sufficiently long to give you easy and quick access to tight and awkward spaces around your backyard, without the extra weight of course. While the Black & Decker brand claims this option is capable of cutting branches up to 0.75-inches thick, it, however, lacks the power to effortlessly and quickly do that. If your backyard or front yard is cluttered by thicker branches, you may want to consider investing in a more powerful alternative. As mentioned earlier, it comes with high performance and long-lasting 20V lithium-ion battery that supplies lots of power for continuous trimming. You'll be shearing some relatively thick shrubs and vines for approximately 40 minutes before having to recharge or swap batteries, if you have a backup one. A back up may be necessary if you tend to go hard for longer or have to shear thick and tough objects. To conclude, the Black & Decker LHT2220 rounds together all the essential features a user would want to see in a hedge trimmer. These features aim to make one's work effortless, quick, accurate and flawless. The lightweight and compact profile allow all family members to control and operate it with ease. Couple the 22-inch durable arm that guarantees superior cutting capacity with the powerful battery and you have yourself one of the best hedge trimmers on the market. For users in search of an easy to use, affordable, reliable and reasonably powerful hedge trimmer to use to keep their homes neat and presentable, the Black & Decker LHT2220 is it. 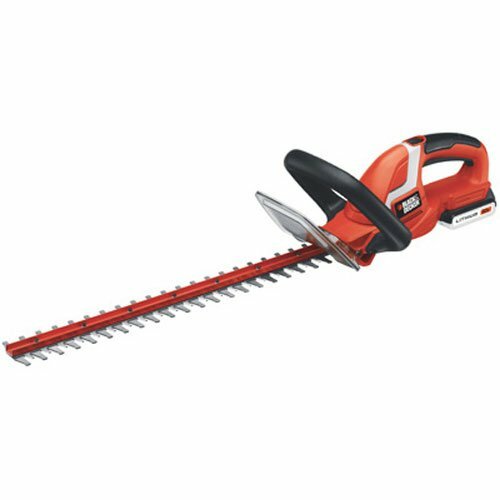 For the particularly thick shrubs, vines, limbs, or branches that the Black & Decker lacks the power to trim, you can count on the DCHT860M1 to quickly rise to the occasion. The machine is ideal for light-duty to heavy-duty use, trimming or shearing down both average and thicker branches, vines, and shrubs with a lot of ease and speed. 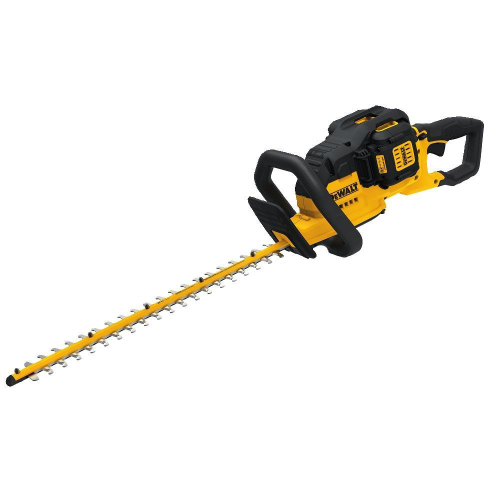 It comes with a powerful motor and a 40V DeWalt that packs twice as much power as the Black & Decker, meaning that it can keep running for much longer if you were to focus on just small branches, shrubs and bushes. Bring together the remarkable battery life and high performing motor of the DeWalt DCHT860M1 trimmer in its compact profile and not even the toughest branches will put up any significance resistance. The hedge hammer's long-lasting and powerful 40V, 4.0Ah battery easily puts its performance at par with gas-powered hedge trimmers on the market. The powerful motor easily roars to life with the first squeeze of the trigger, simultaneously breathing life into the deceptively docile blades. With a full charge, it should provide you with at least 70 minutes of continuous and reliable service, helping you restore some order and neatness to overgrowing branches, shrubs, vines, and limbs. As you would expect, the runtime of the machine heavily depends on the intensity of trimming work you have to do and the toughness or lightness of the trimming materials. The hedge trimmer similarly has a convenient and time-saving battery light indicator that promptly alerts you if you’re running low on battery power, allowing you adequate time to look for a replacement or speed up the process. Like the previous product, it comes with a 22-inch long arm, which also houses the product's two laser-cut serrated blades. The blades take the effort and time away from restoring the neatness of your hedges, making them presentable to both your friends and families. The length brings the farthest branches and limbs within closer reach, shredding even the thickest ones with ease and speed. However, thicker branches and limbs will obviously require more time and some expertise to bring down. The even distribution of weight all through the hedge trimmer means it won't burden the user with too much weight. The construction of the blades is commensurate with the onerous and demanding task of cutting down some of the toughest and thickest branches and limbs growing around the house. The manufacturer's use of rugged, durable yet lightweight steel means the DeWalt DCHT860M1 is fitted with some of the best blades with exceptional edge retention capabilities. You won't be re-sharpening these as frequently as you would those of off-brand models. The fact that the trimmer has a great battery and powerful motor is not enough. However, they make the hedge trimmer a little heavy. The weight of the hedge trimmer comes to 14 pounds with the battery included, which might make it a little difficult to operate or manoeuvre when trying to reach tall branches and limbs. People lacking in upper body strength may finally have a reason to steer clear of the hedge trimmer. While the weight is not tolerable, it will adversely affect your productivity and efficiency with time, slowing you down and causing fatigue. In spite of the weight though, the DeWalt DCHT860M1 works efficiently and powerfully with very minimal vibrations. To summarize, it comes with several instrumental features that would sway the buying decision of any rational user in search of a durable, flawlessly working and easy-to-use hedge trimmer. The hedge trimmer provides you with all these and a 36-month limited warranty to cover for repair or replacement of malfunctioning or defective parts. For users in search of a powerful, durable, and relatively affordable hedge trimmer for taking on the most significant and most challenging projects, the DeWalt DCHT860M1 would be it. The third position deservingly goes to one of the flagship hedge trimmers from the industry giant Greenworks. 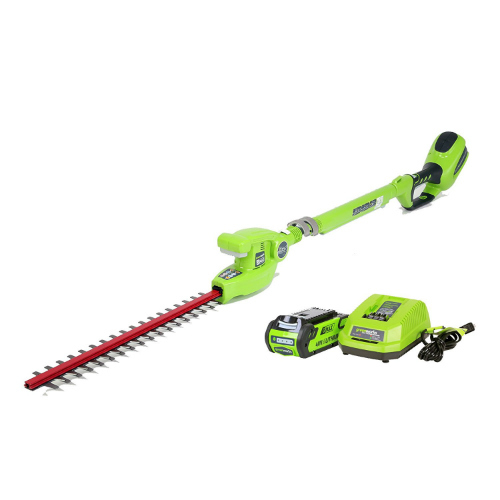 Like the first two hedge trimmer on the list, the Greenworks 20-Inch Trimmer with a 2.0 Ah Battery is both sturdy and dependable, which gives it an exceptional capacity to chew or shear effortlessly and quickly through vines, limbs, shrubs, and branches without the slightest hesitation. It's also quite easy to use and lightweight and compact to manoeuvre with ease and speed. Slicing through different jams is as easy pushing the trigger, and leave it up to the sharp and robust blades to do the rest of the work. For users looking for solid, performance-based reasons to buy it, continue reading for a detailed review. It is an ideal choice to use to reach those tall and out-of-reach shrubs and bushes, without taking the risky route of using a ladder. The features that qualify it for the task include but are not limited to the aforementioned lightweight and compact profile, powerful battery, and the pivoting head, of which the latter makes it particularly perfect for controlled shaping and shearing. Furthermore, the hedge trimmer provides the user with extra reach for easily accessing those tall and hard-to-reach limbs, thanks to the adjustable pole. To adjust the length of the tool, all you have to do is lift the latches placed strategically on the head and handle, then stretch out the pole to a length you find most suitable for completing the task at hand. You can as well adjust the head of the pole to bring the farthest branches and limbs to an even closer reach. On a similar note, you can quickly and effortlessly pivot the head of the hedge trimmer to three different angles, making it possible for the user to cut comfortably and accurately at an angle they find most convenient. The design, consequently, makes the Greenworks 22272 an ideal choice for individuals looking to undertake intricate shearing, allowing you to shape your plants as you want. Each of the blades boasts a length of 20 inches, and there is a gap of 5/8-inches between the cutting teeth. The design means it should be your first and last choice if you have greenery with small branches and limbs that don't require a lot of power to trim. The motor packs a lot of power for quickly whipping the blades into action. However much trimming you have to do, you'll be done pretty quickly, and it powers fast through the toughest greeneries. And you won’t even have to expend a lot of energy to get the job done. It is appropriately lightweight and compact with soft rubberized handle grips that make otherwise tedious and time-consuming overhead projects like trimming quick and effortless. The machine has a paltry weight of just 8 pounds, hardly enough to burden your hands and shoulder or cause fatigue, as is the case with heavy and bulky variants on the market. The performance would be nothing to write home about it if weren't for its battery. However, compared to the first two hedge trimmers reviewed earlier, the battery of the product is not as powerful and therefore does not last as long. Expect between 30 and 35 minutes of continuous shearing from the battery if you'll mostly be dealing with thick greenery. For slightly softer or thinner branches, vines, shrubs, and bushes, expect to get a runtime of between 45 and 50 minutes. Considering the less-than-impressive performance of the battery, it is highly recommended you bring a backup battery with you if you're planning to work for longer. The Greenworks 22272 is compatible with other GreenWorks G-Max batteries, so you if have extra batteries lying around you can bring them with you. In all, the lightweight and compact profile of the Greenworks 22272 makes for trouble-free and efficient shearing of bushes, limbs, branches, vines, and shrubs. The battery life is a little too brief but the user can always opt for more power and longer-lasting 4Ah variant. The manufacturer provides the user with a generously long 48-month warranty and a 12-month battery warranty, which gives you the peace of mind and confidence to work tirelessly to restore the beauty of your hedges. The Greenworks 22272 is, without a doubt, a solid for the price-conscious consumer who wants nothing but the best performance. The qualities and features the Black & Decker LHT2436 packs are similar to those that top-model hedge trimmers bring to the market. The catch with this hedge trimmer though is that it offers the user a taste of the premium features at nearly half the price, meaning that it's an ideal choice for users working on a budget. Also, like the vast majority of hedge trimmers on the market, the Black & Decker LHT2436 packs a durable 24-inch dual-action blade to enhance its cutting prowess while reducing the severity of the resultant vibration to almost indiscernible levels. To these add the powerful 40V battery that's capable of trimming some 6,000 feet on a single charge. It also did not escape our attention that the handle has ergonomically designed grips to enhance comfortability. The trimmer is surprisingly dependable and powerful for a hedge trimmer provided in its price range. The hedge trimmer has a generous 24-month warranty that conveniently caters for the repair and replacement of any defective or malfunctioning parts resulting from the manufacturer's use of low-quality materials or a shoddy manufacturing process. However, all the parts and components of the hedge trimmer reek of high-quality and durable construction and with proper use, it might be some several years before you start looking for replacements for torn and worn out parts. Concerning performance, it has a sturdy 24-inch blade that makes short and quick work of different greeneries, especially those that are too tough or pesky for conventional trimmers to handle. The 24-inch long blades also help you reach with relative ease and convenience to those high and deep placed shrubberies, branches and limbs. The long reach eliminates the need for using any rickety ladders that are prone to tipping over when you’re on them. In fact, so strong and sharp are the dual action blades that they quickly and effortlessly shear through branches as thick as 3/4-inches. The fact that they are made from industrial-grade steel and are pre-hardened and have superior rust resistance properties says a lot about their durability and edge retention. The remarkable performance is only made possible, among other things, by the ergonomic design and the powerful battery. Put together the machine's paltry weight of 6.9 pounds and its compact design, and you have yourself a hedge trimmer that's ideal for all the light to medium-duty landscaping and trimming tasks around the house. Being battery-powered, you won't be bothered by any long and unnecessarily heavy cords or have to awkwardly mix oils and gasoline, as is the case with gas-powered hedge trimmer models. 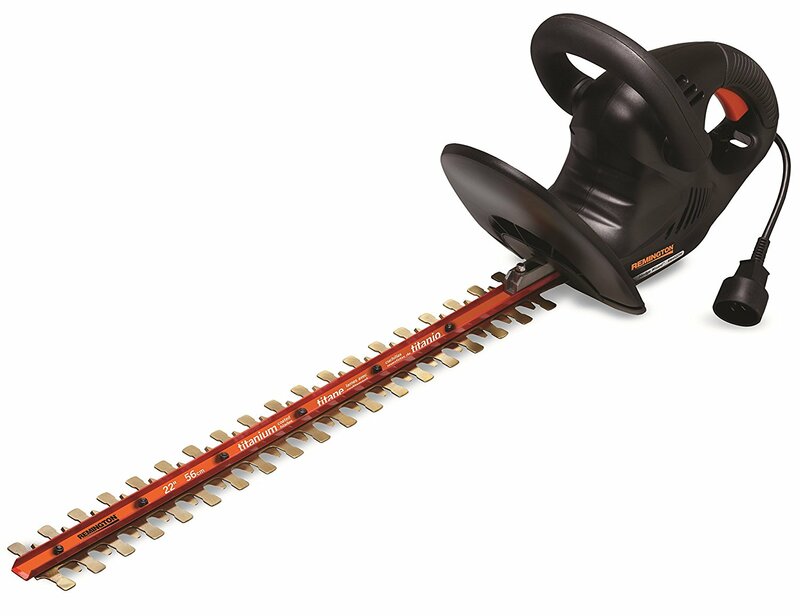 Like we mentioned earlier, the handles of the Black & Decker LHT2436 24-Inch 40V Cordless Hedge Trimmer, both the primary and auxiliary, have soft grips and the whole machine is properly balanced to ensure even weight distribution, making for easy, extensive use. The machine's 40 Volt Lithium-Ion battery provides the machine with more than enough power to enable it to shear quickly through some 6000 acres worth of shrubbery on a single charge. The exceptional performance makes for fewer interruptions which in turn leads you to expend the least effort and time on your landscaping and trimming projects. Plus, the battery recharges really quickly. In all, you have an endless list of reasons as to why you should go with it. The long-lasting and durable dual action blades make for quick and effortless shearing of different greeneries and considerably reduces vibrations. The machine also sports a powerful rechargeable 40-Volt lithium-ion battery that supplies adequate power for undertaking the most challenging and complex trimming and cutting jobs imaginable. For neat, quick, accurate and effortless slicing, look no further than the Black & Decker LHT2436. The 967044601 comes with all the characteristic advantages and disadvantages of a battery-powered hedge trimmer, which makes it no different from any other cordless tool. That's until you scratch the surface, or take a peek under the hood if you will, that you stumble on features and specs that can easily propel it to the top of the list. The trimmer has a good and considerably long-lasting Lithium-ion battery that drains slows, irrespective of performance, to give the user several minutes of an uninterrupted power supply. Unlike other hedge trimmers on the market, the 967044601 does not compromise or overlook important performance or convenience aspects just to keep costs or the overall weight down. It perfectly balances, runtime, performance, usability, durability, and power to give you the best experience. The first convenience worth bringing to your attention right off the bat is the fact that it is a battery-powered machine. That might sound trivial until you note that unlike gas-powered models, you don't have to deal with the messy process of mixing and storing oil and gasoline is specific ratios to realize optimal performance. Another advantage to going with the hedge trimmer, and is more likely to appeal to environment conservationists, is that it does not produce or release any harmful gases to the atmosphere that can corrode the ozone layer. There are even more reasons to consider the battery-operated Poulan Pro. Starting the machine is a breeze. You don’t have to pull at a cord severally to get the motor running; it is equipped with a time and energy-saving push button start button that instantaneously gets the engine up and running, even in the coldest weather. Also, unlike electricity-powered models, you don’t have to get frustrated dragging a power cord that gets tangled among bushes and trees every time you’re slicing through greeneries. As a result, it comes with unrivalled portability. Provided you have a fully charged battery and a backup one just in case, you can work as far away from a power outlet as you want. The same cannot be said of any electrical model. The ergonomic design substantially increases ease of use, making it the number one preference for homeowners and enthusiastic DIYers in search of a trouble-free and smooth performing hedge trimmer. The design and engineering aim to accord the user the best experience possible. To this end, the profile is both lightweight and compact, so the user experiences significantly less fatigue, pain in arm and strain on the shoulders. The hedge trimmer has two handles to increase controllability and manoeuvrability. Furthermore, the two have grips that are soft rubberized to increase comfort. Even though it lacks the power for which gas-powered models are most known, its performance still suffices for domestic use. The machine shears quickly and with little effort through the toughest branches, some of which are as thick as 3/8-inches. And when you point it in the direction of tough and pesky limbs, branches, bushes, and shrubs, it always rises to the occasion, delivering an equally rugged and versatile performance. It does not hesitate or break a sweat when going through the toughest 6-inch grass, ligustrums, and vines. The performance and speed remain just as spectacular when faced with wild brambles. The powerful and slow-draining 40-Volt battery is partly responsible for the incredible performance the 967044601 displays. The Pro tools have the same battery type, meaning that you can interchange the product's battery to get longer runtime. Aside from that, the hedge trimmer also comes with a generous 48-month warranty to cater for the repair or replacement of malfunctioning or defective parts resulting from the brand's use of poor quality materials or less-than-perfect manufacturing process. With this long assurance, you can hunker down to have those overgrowing limbs, branches, and bushes neatly and presentably trimmed quickly and effortlessly. Plus, the battery is fast-charging so that in case the juice runs out, you can get to trimming within just a few minutes. In all, the vast majority of users find it appealing on two major fronts: the exceptionality and reliability of its performance and ease of use. To these add the long-lasting and powerful battery that provides several minutes of continuous runtime, the manageable weight of just 11.5 pounds, and the almost grave-quiet operation. Cutting down overgrown and low-hanging branches, limbs, grass, shrubs, and vines has never been easier as it is with the Poulan Pro 967044601. Users looking for smooth and accurate results need not look further than the Worx WG209, 4-Amp. Designed with the user in mind, the hedge trimmer offers you everything you need to complete slicing the tall bushes, limbs, branches, and vines around the lawn accurately and in a fraction of the time it would take cheaper, off-brand models. The hedge trimmer provides the user with an extra-long 24-inch blade for efficiently and easily reaching tall and out-of-reach hedges and greeneries without the need for using a ladder. 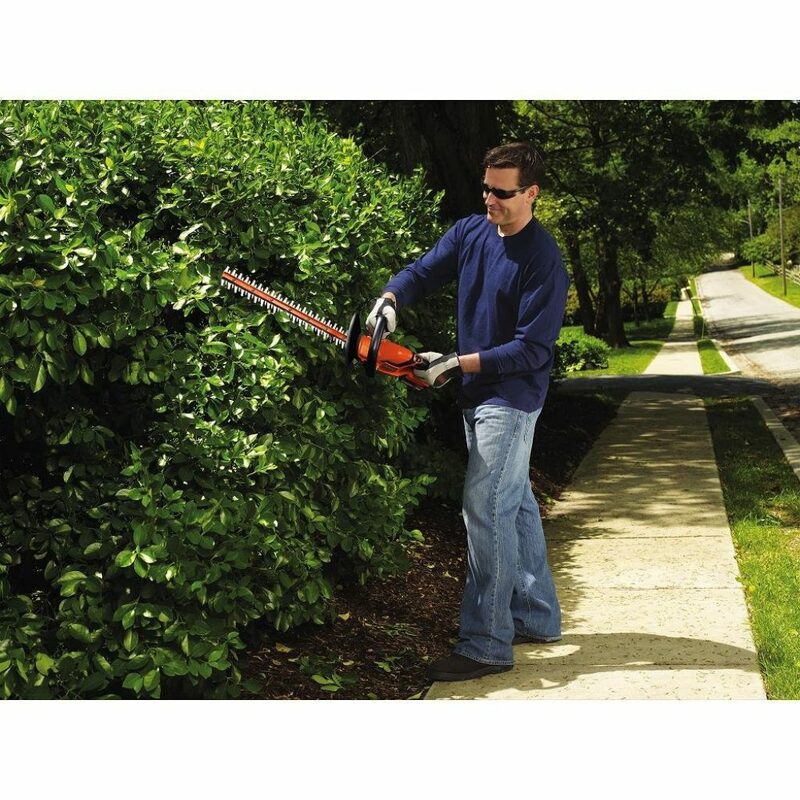 With respect to performance, it packs an efficient and powerful 4-amp motor and dual-action blades that quickly chew through thick and pesky hedges, saving you time and effort in the process. Enough with the overview. Now, let’s delve into a more detailed description of the features to understand how they make the Worx WG209 Hedge Trimmer stand out from a fiercely competitive industry. Furthermore, it spots the most comfortable and easy to use handles that are soft and rubberized so that you can hold them for a much longer period. They are so comfortable that after the break-in period, they begin to feel like a natural extension of your hands. The rubber increases traction, thereby preventing the hedge trimmer from slipping off your hands in the middle of an operation, as is the case with off-brand models. For fast and effortless performance, the trimmer spots the all-powerful 4-amp motor that easily roars to life with the squeeze of a trigger. The motor provides more than enough power to the 24-inch, dual-action blades, providing for easy and quick trimming of large swaths with just a single swipe. The durable and sturdy construction of the blades gives you the confidence to tackle the thickest and toughest shrubbery in a clean, accurate and quick fashion, sparing yourself some substantial time and effort in the process. Also, because it uses dual-action blades, the user will experience far fewer vibrations which, together with the comfortable front handle, will minimize fatigue and strain, making it possible for the user to work quickly and snugly for several hours on end. The design also aims to keep the user safe and sound at all times during the trimming exercise. Safety while trimming is necessary since the blades are capable of spinning at fast speeds, generating a lot of debris that could easily get into the eye and cause blindness. Hence, the hedge trimmer features a useful safety guard to stop the debris from reaching your hands and face and a blade sheath to keep young children and flurry friends from touching the sharp blades. It would also be advisable to take further safety measures like wearing gloves and safety goggles to keep your eyes safe. In closing, we'd like to reiterate that the Worx WG209 is a solid choice for home gardeners in search of a pocket-friendly, lightweight, and aesthetically appealing hedge trimmer. The motor packs enough power to push the dual-action steel blades to shear easily and quickly through different greeneries. Trying to find a better deal at the hedge trimmer's price range will surely prove to be a time-save and futile endeavour. For users looking for a heavy-duty hedge trimmer that’s capable of withstanding the rigours of chewing through the toughest and thickest azaleas and boxwoods, look no further than the Makita XHU02M1 kit. Just to give you an overview of the features the hedge trimmer packs, you'd be glad to know it features a convenient and time-saving blade-change feature that does not necessitate disassembling the machine. Also, it boasts a high-performance motor that delivers speeds of up to 1,350 strokes per minutes that will make short work of those thick, unsightly and overgrown hedges in your front or backyard. Couple that with the sharp and durable blades and the long-lasting battery and you have yourself a machine that is suited for heavy-duty professional trimming. The preference for the Makita XHU02M1 among professional trimmers is informed by several reasons, principal among them being its exceptional performance. The machine has a slightly shorter blade measuring 22-inches in length but which nonetheless significantly increases its cutting capacity, allowing the user to work much faster, more accurately and with less effort. 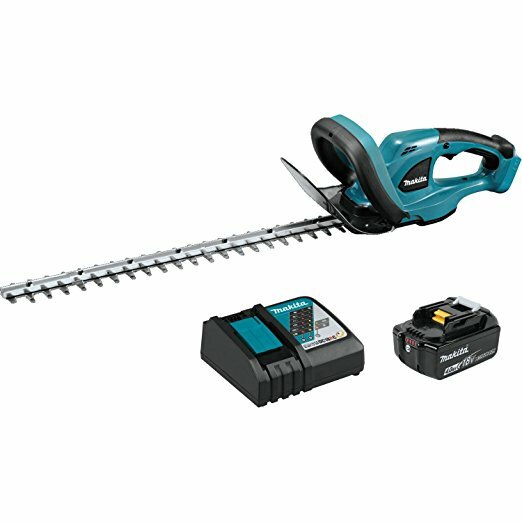 To further aid the performance aspect, the hedge trimmer packs a powerful Makita-built motor. The motor easily and reliably delivers speeds of about 1,350 strokes per minute. The implication here is that you'll be done with shearing vastly overgrown hedges and greeneries in a fraction of the time it would take cheaper, off-brand models. Using it is also very convenient. The machine packs a bunch of features aimed at taking away the frustration, effort and time that users typically have to expend to get the work done. Being a battery-powered model, you don't have to drag with you reserves of oil and gasoline whenever you go trimming, and you don't have to worry about staining your work overalls or floor surfaces with oil and gasoline when mixing the two to get the machine working. The Makita XHU02M1 furthermore requires very minimal maintenance and works smoothly and efficiently with very little noise and vibrations and does not produce a single trace of hazardous emissions to the environment. There are no power cords to drag behind you as you work, limiting your reach and portability in the process. With unlimited portability, you can work from anywhere and go anywhere with it, as long as you have an extra battery just in case the installed one runs out of juice. The Makita Lithium-Ion 18V may not be as powerful as the 40V or 20V variants used by other hedge trimmer variants on the market, but it sure gets the job done. It has a convenient battery-capacity warning system that immediately kicks into action when the battery is running low by giving you a warning and simultaneously stopping the motor. It has the advantage of charging quickly, though, so that you don't waste time waiting for it to charge full and instead spend more shearing at greeneries on you back and front yard. The lightweight design keeps fatigue at bay while the user works. With a mere weight of 7.4 pounds, it spares your shoulders, arms, and hands any unnecessarily excessive weight. You could work without wearing earplugs as the noise level is low, at just 87 decibels, meaning that you won't be a nuisance to your neighbours even if you were to go to trimming in the wee hours of the morning. And because it is much quieter, it also goes without saying that it produces considerably fewer vibrations, which in turn translates to reduced fatigue. Lastly, the hedge aims to keep you safe as you work to prevent any injuries, accidental or otherwise. For instance, the only way you’re going to activate the motor is by first engaging the top handle and the trigger. The safety feature guarantees that in case one hand accidentally slips, the hedge trimmer’s motor ceases operation instantly. Consequently, your hands or fingers will always be safe. Additional features include the soft rubberized grip that ensures a comfortable hold for extended use and the razor-sharp blades that power effortlessly and quickly through any branch with a thickness of anywhere between 1/3-inches and 3/8-inches. Plus, every purchase accords you a generous 36-month warranty. For professional work, the Makita XHU02M1 comes highly recommended. It offers the user incredible power for accurate, quick and effortless trimming. It has several safety features to keep you and your loved ones safe and five cushions inside the motor to minimize vibrations and user fatigue. The 22-inch blade has a cutting speed of 1350 SPM, and the battery provides a runtime of about 120 minutes, enough to finish all your trimming work. Plus, it is lightweight, has soft-grip handles and is almost noiseless. It is one of the best deals on the market currently. Competition in the hedge trimmer industry is fierce, which works to the advantage of the consumer as it brings down prices and inspires innovation among manufacturers to maintain a competitive edge. Speaking of innovation, the Remington RM4522Th packs a bunch of innovative features, including a robust frame that guarantees the user effortless and quick trimming. Additional features that make it appealing include an ergonomically designed and soft, cushioned handle grip. Together with the professional balancing and lightweight construction, these features increase comfort and reduce fatigue as the user undertakes light-duty to heavy-duty trimming projects around the house. To conclude the overview, we’ll mention that it also comes with a sturdy lock for preventing the cord from getting inadvertently unplugged during use. The performance easily exceeds all consumer and industry expectations, as evidenced by the rave reviews and sterling ratings it has garnered from various online stores. It comes with all-titanium coated blades that are both durable, razor-sharp and can retain their sharp edges for much longer compared to cheaper alternatives on the market. Considering the rugged and strong construction of the blades, it is, therefore, an ideal hedge trimmer to use to shear the toughest, thickest, and peskiest branches, limbs, shrubs, and vines. Bring together the 22-inch blades and the high performance 4.5-amp electric motor, and you got yourself a hedge trimmer that trims different greeneries cleanly, quickly and accurately. And also with significantly less noise and vibrations, thanks to the dual action cutting blades. Present it with a limb or branch that's up to 3/4-inches thick, and you'll marvel at the incredible performance of the Remington RM4522Th. Keeping nature in line with it is reasonably easy and straightforward. The machine comes with two handles to increase stability, and it's also lightweight and compact to make it easy to manoeuvre and control when trying to access awkward and hard-to-reach places around the yard or garden. The lightweight design and exceptional balancing of the hedge trimmer also increase usability, and make it hugely appealing to enthusiastic DIYers and professional trimmer from around the world. The weight puts just a necessary amount of pressure on your arms, hands, and shoulder but not too much to cause fatigue, joint pains or straining. The handles feature a cushioned grip to ensure the hands are invariably comfortable when you're out there restoring neatness and beauty to your hedges. With a 4.5-amp motor, 22-inch titanium-coated dual action blades and a lightweight profile, the trimmer with Titanium Blades is patently one of the best hedge trimmers you can find on the market. The learning curve is pretty gentle, and the weight is commensurate with the rigorous task of slicing through different branches, limbs, bushes, vines, and shrubs. The hedge trimmer is available at a pretty affordable price, in spite of its premium features and specs. For users in search of a spectacular hedge trimmer that is devoid of the bells and whistles that typically inflate prices, look no further than the Remington RM4522Th 4.5-Amp 22-Inch Electrical Hedge Trimmer with Titanium Blades. The fact that Greenworks has two of its flagship products featuring on our list of ten of the best hedge trimmers is a testament to their unyielding commitment and devotion to the production of high-quality, durable, usable, and practical products. Their second product on this list is the Greenworks 18-Inch 2.7-Amp 22102. The hedge trimmer can generate power of up to 3,200 strokes per minute, which means, and we kid you not, it cuts through limbs, branches, tall grass and overgrown like a hot knife cuts through butter. The hedge trimmer does not hesitate or slow down even slightly, irrespective of the workload and its performance is always spectacular, enabling you to slice accurately, quickly and in no time at all. Plus, it works smoothly with minimal push-back and has perfect hand grip to minimize slippage during use. It has a powerful 2.7-amp motor that makes short work of the different types of vegetation growing on your lawn, garden, or yard. However, it lacks the power to go through thick or tough plants. If you want something more powerful, you may have to look further afield. For occasional trimming and landscaping around the house, however, it more than suffices. It is also equipped with dual action steel blades which are perfect for manoeuvring through tall bushes, shrubs, and hedges, making it much easier to shape and pattern them in accordance to your preference. However, the blades will not accord you a very extensive reach compared to those of other hedge trimmer seeing as they only measure 18 inches in length. Still, we’ll iterate that they are perfect for domestic use, in which shrubs and bushes with less than 3/8-inches in thickness don’t present much of a challenge. Another thing you'll love about it is its lightweight and compact design and the fact that is constructed using the highest quality materials available to the industry. The diminutive profile ensures ease of use and allows you to use it for several hours on end with minimal fatigue or hand straining. As a result, you can use it for several hours a day, every day and still feel comfortable at the end of the day. The handle grips are soft and rubberized, also with the aim of increasing comfort and keeping at bay any possibilities of straining your hands or developing blisters after a hard day out in the yard restoring beauty and neatness to your low-hanging and overgrowing hedges. Additional convenience features include a cord lock that prevents the cord from accidentally unplugging while working. On an entirely different note, it is an ideal choice for the environmentally conscious keen on not contributing to the burgeoning carbon footprint in the world. The hedge trimmer does not produce any harmful carbon emissions. Neither does it vibrate any more violently than typical hedge trimmers do. Pus, the motor runs smoothly and quietly, producing a soft and almost entertaining humming sound in the background that won't irritate your neighbours or attract the attention of law enforcement agencies should you decide to go trimming and landscaping in the wee hours of the morning. The construction is top-notch, and it even comes with a 48-month warranty to cater for the repair or replacement of parts or components that malfunction or become defective as a result of the use of inferior quality materials or poor workmanship. While the Greenworks 22102 is many things, it is not even remotely close to being classified as a slouch with regards to performance. It is one of the renowned workhorses that come with a powerful, reliable and smooth-running motors in the industry and using it is a cinch. In addition to making short work of the greeneries like tall grass, bushes, vines, shrubs and limbs on your garden, yard or lawn, the hedge trimmer similarly built to last. The battery-powered machine slices effortlessly through hedges and shrubbery and boasts a lightweight design that minimizes fatigue. Plus, it has a generous 48-month warranty from the day of purchase. In all honesty, you'll enjoy using the Greenworks 22102, and you'll thank yourself for going with your guts on this one. Most hedge trimmers will endeavour to provide you with one of two things: remarkable and quick performance or ease of use. The DeWalt DCHT820P1 is, however, a notable exception, being one of a handful of hedge trimmers that try and succeed in providing the user with the best of both worlds. It perfectly combines outstanding performance and superior usability in a compact and lightweight profile that's also durable and very practical. The product's 22-inch blade, generous 36-month warranty, and lightweight frame that weighs just 11.5 pounds make an all-time favourite of enthusiastic Do-It-Yourselfers, homeowners, professional trimmers and even novices. The DeWalt DCHT820P1 is as powerful as it is usable. It spots fairly long 22-inch laser cut and razor-sharp blades constructed using high quality, rugged yet lightweight materials to provide for the best cutting experience. The sturdy construction also means the blades have outstanding edge retention capabilities and will stay sharp for a long time, even with frequent, heavy use on thick and tough overgrowths. Being 22-inches in length, the blades also bring within reach branches, limbs, vines, shrubs and other things that were once out of reach. The icing on the cake though, is that its length eliminates the need to use those long, unstable ladders your neighbours are still using. You can effortlessly and quickly cut those dangerously low-hanging branches with a thickness of up to 3/4-inches, in a fraction of the time it would take cheaper, off-brand models. The aggressive and unrelenting performance is further aided by its powerful, quickly-recharging and slow-draining battery and its lightweight design. Beginning with the latter, the DeWalt DCHT820P1 is both compact and light, even though pictures of it do not fully let you in on this fact until you grasp at it with your hands. It has a commanding presence in the hand, and the ergonomic design of the handles significantly increase ease of use, practicality, and manoeuvrability. The handles have soft, rubberized grips to increase traction to prevent slippage even when working under different weather conditions. You can use it for overhead trimming and landscaping the entire day, and the risk of straining your hands or of suffering hand fatigue will be very minimal, meaning that it is a solid choice for people lacking in upper body strength or senior members of the society. The same goes for individuals suffering from herniated or bulged discs. Apart from the long blades, the exceptional balancing, and the aggressive cutting, thanks to the high-performance motor, the hedge trimmer similarly has a powerful and long-lasting battery. It can easily provide the user with several hours of use if one was to use it strictly to slice through light greeneries around the house. It comes with a 5.0 Ah high-capacity Lithium-ion battery that ensures the motor relentlessly runs all through use. Using it on tough and pesky overgrowths will, however, drain the battery much faster, which makes it all the more prudent to invest in a backup battery. 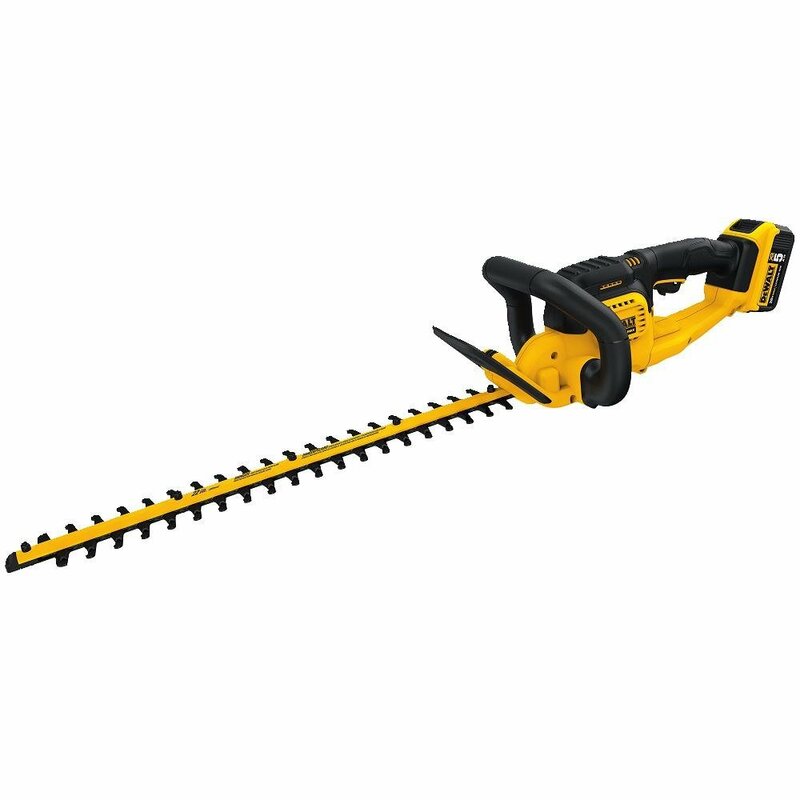 You additionally get a heavy-duty and durable sheath for storing the DeWalt DCHT820P1 20-V Max Hedge Trimmer with 5AH Pack in-between uses. For additional safety, the blade features a special design with rounded edges that does a spectacular job minimizing or eliminating inadvertent shearing. The dependability and power are hard to beat. It performs powerfully, quietly, quickly, accurately and effortlessly. Its handy performance sets it apart from its closest competitors, especially when faced with holly bushes, azalea bushes, boxwood and privet hedges. The 5.0 Ah battery similarly lasts for considerably long and using the hedge trimmer is quite a cinch, thanks to the soft, rubberized front grips of the handle. To this add the 24-inch dual-blades that trigger significantly less fatigue and provide for a smooth, quiet, and vibration-less operation. In light of these features, we'll confidently say the DeWalt DCHT820P1 is quite a steal, at its price. Your decision on the most suitable cutting capacity for your preferred hedge trimmer needs to take into consideration the thickness of the branches, limbs, shrubberies, vines and other greeneries you intend to trim. The cutting capacity, in turn, depends on the type of machine you’re buying. Gas-powered models are considerably more powerful and capable of quickly and effortlessly cutting through branches that are up to 1-inch thick, a fete battery-powered and electric models would struggle to emulate. Typical cordless and electric trimmers offer a fairly generous cutting capacity of between 3/8-inches and 1/2-inches, even though the vast majority will manage a thickness of up to 3/4-inches. Another important factor closely related to cutting capacity is the length of the blade. They mostly range between 16 and 24-inches. For high and hard-to-reach hedges, consider going for a hedge trimmer with a long blade to make your work easy, quick and convenient. 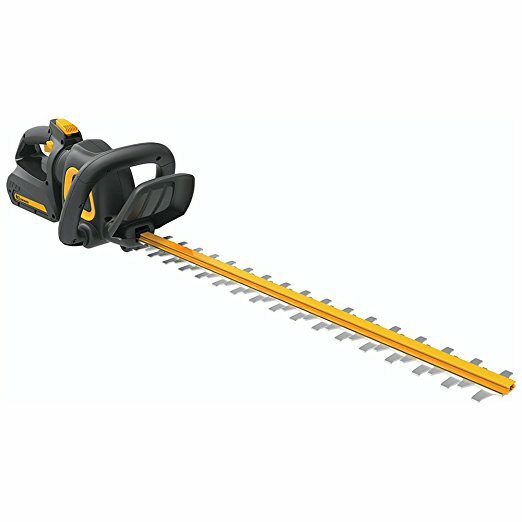 While this brief is intended for general public consumption, it is more geared towards homeowners and enthusiastic Do-It-Yourselfers who do occasional landscaping and trimming and who therefore need hedge trimmer for light to medium trimming tasks. Consequently, cordless and battery-powered hedge trimmer would be ideal for this group, considering that their gas-power is optimized for professional gardening on large or expansive properties. Because they don’t come with cords, gas-powered models offer the user greater portability and are similarly easy to transport and are capable of running for long periods of time. They, however, have the disadvantages of being noisy and expensive to run. Electric hedge trimmers, like battery and gas-powered models, have their fair share of strengths and weakness too. While they are ideal for smaller landscaping and trimming projects, you’ll have to contend with having to drag a sometimes heavy extension cord with you all the time, sometimes even risking accidentally cutting it. Your last choice, battery-powered models, on the other hand, boast incredible usability, practicality, and portability even though you’ll always need to ensure you have a fully recharged battery before venturing out. Weighing the advantages and disadvantages of each of these against your preferences should help you narrow down your choice. Considering that trimming is a most overhead project, depending on the height of your hedges, it can be quite taxing. As a result, another important consideration to keep in mind before committing your hard earned money is the weight of the unit. Gas-powered and electric hedge trimmers lie on opposite ends of the weight spectrum, with their battery-powered counterpart falling in between. It goes without saying that the former is the heaviest of the three. In some instances, battery-powered models can pack more weight if they have especially heavy batteries. Also, even weight distribution can significantly help with ease of use and manoeuvrability and controllability. Some hedge trimmer models offer the user more than superior cutting experience; they also aim to make the work quick, accurate, effortless and enjoyable. To this end, you might come across different models with a lot of flair or bells and whistles to increase convenience and ease of use. Some heavy hedge trimmers have shoulder straps for relieving strain on the arms while others feature ergonomically designed handles to enhance comfort and guarantee manoeuvrability. Others come with noise mufflers and anti-vibration mechanism to provide you with a peace of mind as you work. Still, others come with laser-cut blades with exceptional edge retention capabilities that are guaranteed to stay sharp for much longer, thereby providing for cleaner, more accurate and straight cuts. Individuals keen on getting the most value for their money should go for a hedge trimmer with most, if not all, of these features. Q: How do I stay safe while using a hedge trimmer? A: As is the case with most power tools, the importance of wearing the right protective gear can never be stressed enough. Eye protection is necessary as it protects the eyes from all the flying debris. Ear protection is also necessary but only for those using gas-powered models or the overly cautious users who don’t want to risk losing their hearing sensitivity. Additional measures include wearing gloves and always being mindful of your cord to prevent inadvertently cutting it. After use, make a point of religiously cleaning your unit to get rid of all the debris and to keep it safe and far from the reach of children. Q: How about maintaining the hedge trimmer to ensure optimal performance? A: Maintenance comes with far fewer rules compared to those you need to observe when using it. The gist of it though is to give the hedge trimmer a thorough cleaning after each use. Manufacturers strongly advice using water for cleaning, though. Lubrication is also a key component of maintenance, and it should be done after each use. Hedge trimmers are an ideal choice for users looking to trim, prune or cut their hedges and bushes, leaving them looking neat and picturesque. Choosing the right one in a market flooded with them may be an uphill task but once you’re conversant with the features to look for, finding the most suitable one can be an effortless. All the hedge trimmers on our list of Best Hedge Trimmer have several things in common: they are high-performance, easy to use, affordable, and they give you your money’s work. Going forward, irrespective of your choice, landscaping and trimming your hedges will be a quick, effortless and accurate endeavour.